Maria is the younger daughter of an esteemed family on the island of Murano, the traditional home for Venetian glassmakers. Though she longs to be a glassblower herself, glassblowing is not for daughters—that is her brother's work. Maria has only one duty to perform for her family: before her father died, he insisted that she be married into the nobility, even though her older sister, Giovanna, should rightfully have that role. Not only is Giovanna older, she's prettier, more graceful, and everyone loves her. This book was a complete surprise for me. I picked it up at NCTE on a whim, having never heard of it before nor any idea what it was about. 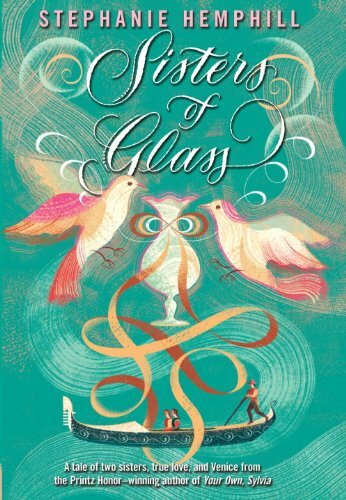 When I got home and saw that it was about the daughters of Venetian glass blowers on the island of Murano, I was sold. I tend to be compelled to read any book that takes place in Europe since I lived and traveled there for over a year. But then seeing it was a novel in verse, and coming in at a petite 150 pages, it was actually the first ARC I read, even over some of the much coveted ones I've been dying to read for a long time now. Novels in verse are always quick reads, but sometimes they can be frustrating because there is so much that you have to infer from all that is NOT said. As I read this story, I kept wondering to myself how different it would be if it were written in prose rather than verse. Would the added detail help the story or hurt it? But then I allowed myself to stop wondering how it COULD be, and just let myself enjoy what it was, which is a lovely, quick read for lovers of novels in verse, and/or historical fiction. The ending was a little TOO neat and happy for my liking, but at the same time, it's certainly one that will satisfy readers. Wow sounds very different, interesting, and cute. Thanks for putting this on my radar. I'll be on the look out.